We are involved in manufacturing, exporting and supplying Pre Heating Dryer at affordable costs. Batch as well as conveyorised operation. Unique non-contact heating design for operations requiring no airborne dust should settle on the components. Low cost of drying due to no heat up time and shortened drying time. Enhanced quality of the coated surface due to inside-out heating. 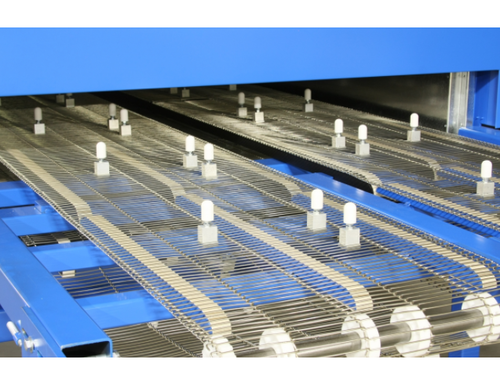 Preheating of components in a batch / conveyorised application. The ability to study customer’s applications and provide customised solutions is Litel’s unique strength. This is done by a team of engineers with design expertise in various aspects of thermal engineering, control engineering, automation, air handling systems etc. Most customers approach Litel with problems rather than pre-determined specifications. Litel engineers work out optimum solutions to fit the process requirements, space available and energy constraints to ensure proper payback of the equipments. The set up includes an Application & Technology Center used extensively for establishing parameters at the enquiry stage. It also has smaller prototypes of various kinds of IR heating systems. However, the controls are full-scale. Such an approach helps in arriving at the correct solution and helps minimize the risks inherent in building large customized equipments which can be tested only after they are completely manufactured. In recent years a major addition has been PLC based automation and controls to ensure consistency, repeatability, reduction in human intervention and digital diagnostics. We are a process focused company. ISO9001:2008 certified company by QAS, Australia and a special recognition – DSIR certified R&D Lab by the Ministry of Science & Technology, India. We have won several state and national awards for contribution to the industry for energy efficient solutions.